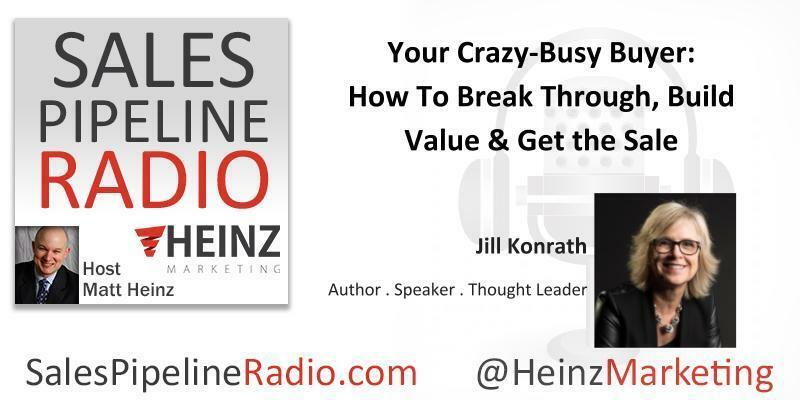 I'm very honored to have Jill Konrath join me to talk about her latest book, More Sales, Less Time. Jill Konrath’s career is defined by her relentless search for fresh strategies that actually work in today’s sales world. Listen in to hear how someone with a Bachelors in Education ended up getting into sales, let alone becoming a keynote speaker in one of the world's preeminent sales office. Jill shares some great insights including the inspiration behind her books. "It starts with a problem. It always starts with a problem and in every case and every book I've written it started with a problem that I faced. And when I face it initially, I get really discouraged and I bat my head against the wall and say, oh I'm so stupid. I can't figure it out and then I finally realize that it's not just my problem, but other people are struggling with that issue, too. And then I go to work and it becomes like a puzzle to me and how to solve it. So, I actually dig in and wrestle with the material myself til I can figure out what works today. And then, again I guess because I do come from teaching roots it's real important for me to make it easy for people to understand. "When people are this busy, you have to fundamentally shift how you do things in order to peak your curiosity, make them stop and listen and actually then respond to you and say, hey I'm interested in learning more." "One thing I always try to stress with people is that they really need to stop and think about what they're doing and they need to strive for maximum impact in every single customer interaction and that customer interaction may be a 20 second email message. Maybe a 60 word ... or 20 second phone message, a 60 word email message, you know, but what can you do to have the maximum impact and I think way too many people in sales just say, make more, do more, send more, have more meetings. But, to me the smartest thing to do is ensure that every single interaction provides some value and moves you toward things"
Keep listening to hear Jill's perspective about women in sales and a lot more! Read the entire transcription on the Heinz Marketing Blog on Monday, 3/12/18.